The course of Advanced Level 3 & 4 of EMMC Boot Repairing and Programming. Learn How to Check PCB track of EMMC, Reball EMMC, troubleshooting and more. EMMC stands for Embedded Multimedia Card which is a small storage device which flashes memory and a simple storage controller. 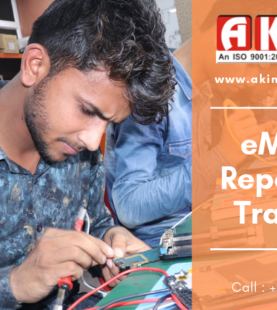 AK info offering a 10 days mobile eMMC course in Karolbagh, Delhi, where you will learn how to give a dead mobile a whole new life. Join the best eMMC repair training institute in Delhi and start a blazing career. The EMMC embedded flash memory applications which were developed in 2006 by JEDEC and the Multimedia Card Association. A Course in EMMC will enlarge your skills in mobile repairing. If you join this short-term course, it makes you a substantial expert. There are multiple courses you can enroll in, it’s up to you whether you want to join a short or long-term course. The entire course will give you in-depth knowledge about how to repair an eMMC. At AK Info, students get maximum practical training and opportunity to work on live projects. During the training, we organize industrial visits. These sorts of visits make our students familiar with the work environment and how to resolve major eMMC problems. It will give you a hand to hand way to handle your own projects in training. We don’t believe in theoretical as practical gives in-depth knowledge. 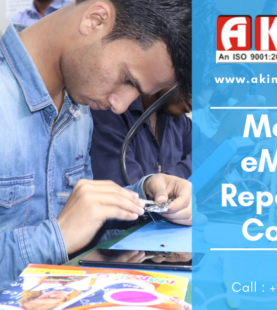 Any student can earn the eMMC Repairing Course from AK Info. AK Info offers 100% job assistance and full business support. After the completion of the course, we help you to start your own service center or institute and also provide you with market knowledge of various mobile’s parts and tools. How To Join the Mobile eMMC Course? The enrollment process of eMMC repairing training is easy and smooth. We always work to offer the best course, if you want to join this 10 days eMMC training program from Delhi, then you can call us at 700 400 9069 and schedule your Free demo session. This free demo class will give you ample ideas about the course and you can be benefited with the course. Make a Powerful career in Mobile industry and by repairing the dead mobile phone. Book a free demo class, you just need to class us at 700 400 9069.